The US space agency Nasa has unveiled a powerful new tool in its quest to unravel the mysteries of the Universe. 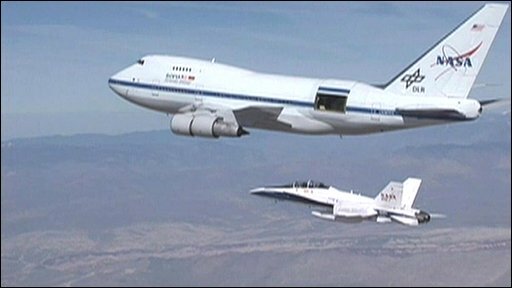 The Stratospheric Observatory for Infrared Astronomy is a modified Boeing 747-SP aircraft known as Sofia. Developed in partnership with the German Aerospace Centre, DLR, the 'plane is the only flying astronomical observatory in the world. It carries a 2.7m telescope, and offers astronomers a unique opportunity to explore the cosmos. It can identify objects that emit radiation at infrared wavelengths, which are not visible to the human eye. For years, astronomers have been looking forward to the day when they could carry out their work beyond the obscuring water vapour of the Earth's atmosphere. Airborne astronomy started in the 1960s when the planetary scientist Dr Gerard Kuiper pointed a 30cm telescope out of the window of a plane. Between 1974 and 1995, Nasa operated a telescope from a military cargo plane. But Sofia is a major step forward. The aircraft flies at up to 45,000 feet (13,716m). The high altitude means it is above 99% of the water vapour that absorbs most infrared radiation from space. In effect, it opens a window to the Universe that was previously obliterated from view, and allows observations to be made that are impossible with Earth-bound telescopes. Sofia is based at Nasa's Dryden Aircraft Operations Facility on the outskirts of California's high desert. "People have been working on this project for well over a decade," says Bob Meyer, Sofia programme manager. "There are some folks here that have dedicated half of their careers to getting Sofia flying, and we are on the cusp now of the first science flights. It really is exciting." 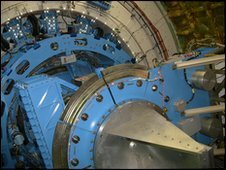 The 40,000-pound (18,181kg) telescope assembly is housed behind a huge cavity door in the side of the jetliner. "It is open to the atmosphere," explains Mr Meyer. "There is nothing obscuring the view of the telescope itself; and on the cabin side of the bulkhead, the scientists can ride along in a shirt sleeve or airline type environment and make the astronomical measurements with science instruments that are installed on the telescope." Nasa is completing the test flight stage of the project. The first science flights are due to take place next winter. The goal is eventually to fly 100-150 nights a year, for the next two decades. Each flight will have 15-20 people on board, and will cost $100,000-$150,000 (£65,000-£97,000). Flights will last about nine hours. Sofia will explore the Universe in minute detail. It will investigate molecular clouds to find out how stars and planetary systems form. Evidence will be sought that can help astronomers understand the origin of life by studying complex biogenic molecules. Scientists hope to learn how galaxies evolve with time by studying the dust and gas within them. Sofia will also make measurements associated with comets and their characteristic tails. There is a long-held theory that comets, colliding with Earth millions of years ago, may have brought water and other raw materials that made life on our planet possible. "I find this particularly fascinating," says Mr Meyer. "Comets glow as they get nearer to the Sun, and most of the other infrared observatories that are in orbit aren't able to turn and look at comets when they're that close to the Sun. "Sofia will be able to do that. So we'll actually be able to measure and look at the tails of comets and actually measure the chemical constituents." John Carter, Sofia aircraft project manager says: "This is a once in a lifetime project. "It's an incredible engineering feat. This is one of the airborne machines that truly defies the imagination." Sofia will operate, primarily, from Southern California. But the aircraft will fly from other locations around the world as required by the scientists and in response to astronomical events. "It's hard to know exactly what Sofia is going to contribute to the science of the formation of the Universe and our own Solar System," says Mr Meyer. "But I am sure it will make significant findings that will really contribute to the overall knowledge and understanding of how we got here and where we're going."